A page from the 1947 Sears, Roebuck & Co. catalogue shows fasionable dresses available by mail order. spend hours and hours in front of a computer. But it was only recently that I realized the same type of thing had been done as far back as the 1940's, and probably much earlier, but it wasn't in any way made available electronically. Shopping for just about anything at all could be done from the comfort of your home, and whatever a person was looking for, and then some, could most likely be found in something as simple as a Sears, Roebuck and Co. catalogue. Charles Ward, a good friend of mine, brought me a copy of a 1947 Spring and Summer Sears catalogue his dad found in an old log home Charles owns. The catalogue is in amazingly good condition. As I looked through the catalogue, I was surprised that I forgotten what all could be ordered by mail. I considered listing all the categories available, but was soon gave up on that idea, realizing in just a matter of minutes what an overwhelming task that would be. It's unbelievable what was included in that catalogue, everything from items such as uniform shirts for delivery men or school bus drivers to bottles of castor oil and Milk of Magnesia. Kerosene lamps, lamp parts, asphalt siding, and even real live baby chickens could be ordered. Fruit trees, nut trees, seeds, and sprays for gardens and trees were available. Alarm clocks, fountain pens, razors, vitamins, hospital beds, folding bathtubs, sinks, commodes, sewing supplies, ash trays, smoking stands, Harmony House stemware, ceramic figurines, window shades, dresser sets, Woodbury Cold Cream, Ponds Cold Cream and Dusting Powder, soap sets, talcum powder, perfume in glass bottles with frosted designs could be found, and ladies gloves and hats included quite a nice selection. For the men there were archery items, hammocks, croquet sets, Silvertone radios, poker cards and chips, weather instruments for measuring temperature and humidity, camping supplies, golf clubs, tennis rackets, basketball shoes, and a complete selection of J.C. Higgins fishing tackle, everything from lures, minnow buckets, fishing line and hooks .... the list goes on and on. One thing not included in this catalogue ... there were no televisions. I suppose the year 1947 was just prior to tv's being introduced. 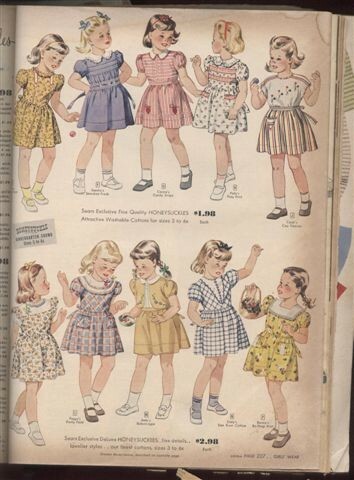 Catalogue pages like this one made perfect paper doll cutouts. All kinds of clothing was for sale in a Sears catalogue, something for every single member of the family. Kerrybrookes brand junior dresses were listed for $4.98 each. Women's everyday dresses sold for $2.69 to $3.19 each. Many styles of Kerrybrookes shoes, for men, women, and children, were also offered. 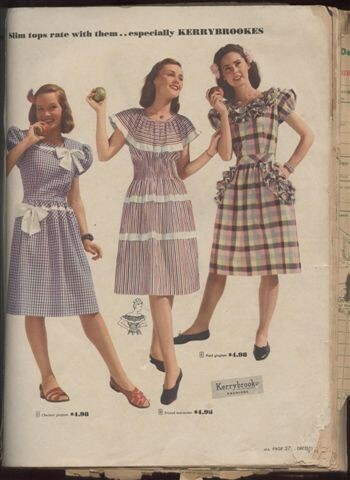 Sun dresses, aprons, and smock tops were shown on one page with the words "even the teakettle will whistle when you wear these around home." The price for a teakettle whistling sun dress was $5.29. Children's scooters, coaster wagons, toy wheelbarrows, and what was called a "sleek and speedy little roadster" were priced anywhere from $2.79 for the wheelbarrow to $16.95 for the roadster. Actual photographs were included in the catalogue, some in color, but most of the items were hand drawn and very realistic looking. I remember how excited my kids used to be when the J.C. Penney Christmas catalogue arrived in the mail. Naturally, they fought over who got to look at it first, but would often end up side by side in the living room floor with the catalogue in front of the one in the middle. Many happy hours were spent that way until first, their wish list was complete, and second, the new wore off of the catalogue. I imagine that’s how it always was with the arrival of any catalogue that came to families in the mail. And there were additional uses for catalogues long after they were no longer used for mail order items. Lots of little girls, myself included, spent many happy hours cutting out paper dolls from an out of date catalogue. I loved playing paper dolls. Even though I enjoyed the ones I cut out from old catalogues, I suppose my very favorite ones were some my mother bought for me once while we were on a shopping trip to Nashville with my Aunt Rose. I found them in either Cain-Sloan, or Castor Knott Department store, Aunt Rose’s favorite places to shop, I just don’t remember which one we were in when I found them. When I picked them up and looked at them, I really didn’t think it would be something my mother could afford, but that particular time, she bought them for me. I’ve never forgotten that. But the ones I consider my next favorites were hand drawn by my schoolmate, Wanda Barnes. I thought she was a very talented artist and I pestered her quite often to draw paper dolls for me. Those Wanda drew for me looked as good as any hand drawn models shown in the Sears catalogues. Computers can be found today in almost every home, and used for everything from paying bills on line, to shopping, and for communicating with one another. But after spending some time reminiscing with that very old and out of date Sears catalogue, I’ve decided there’s a lot to be said for how things used to be done. After all, it’s just about impossible to cuddle up in a favorite chair, near the fireplace on a cold winter day, with a computer, even if it is a laptop. A catalogue fits in your lap a whole lot better, and turning pages one by one, looking through your favorite things, just makes for a great way to while away the hours. If interrupted, it was very simple just to lay the catalogue down, to picked up at another time. There’s no turning it on and off, no waiting for it to do the routine required before getting on line, and it didn’t cost a cent to look at. Looking through a catalogue from 1947 is a good way to travel back in time, and while on that journey of looking at how things used to be, it’s amazing how many times the words "I remember that!" come to mind.